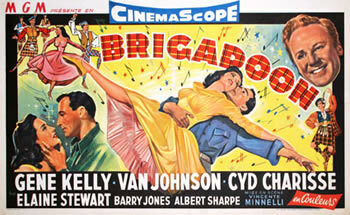 Americans Tommy Albright (Gene Kelly) and Jeff Douglas (Van Johnson), on a hunting vacation in Scotland, discover a quaint and beautiful village, Brigadoon. Strangely, the village is not on any map. The villagers are making preparations for a wedding ceremony, between Charlie Chisholm Dalrymple (Jimmy Thompson) and Jean Campbell (Virginia Bosler), and Tommy is smitten by Jean's sister, Fiona (Cyd Charisse). But he discovers an old book that suggests that Fiona was born over 200 years ago; she takes Tommy to an elder, Mr. Lundie (Barry Jones) who explains that Brigadoon is an enchanted place. It appears once every hundred years for one day, then disappears back into the mists of time, to wake up to its next day a century hence. As the end of Brigadoon's day approaches, Tommy must decide whether to stay there with Fiona, or return to his life in America. Filled with fears, he leaves the tearful Fiona as she disappears into the mist. Several months later, back in America, Tommy meets with his new fiance in a crowded and noisy Manhattan bar. The more she talks, the more he remembers Fiona and Brigadoon. He calls his friend Jeff and says that he wants to return to Scotland. They arrive at the site of Brigadoon, only to confirm that it doesn't exist. But as Tommy mourns his loss, a heavy mist gathers, and Mr. Lundie appears on a nearby bridge. He tells Tommy, "If you love someone deeply enough, anything is possible — even miracles. They run to the village and Tommy is forever reunited with Fiona.